The Royal Aircraft Factory S.E.2 (Scout Experimental) was an early British single-seat scout aircraft. Designed and built at the Royal Aircraft Factory in 1913 as the B.S.1, the prototype was rebuilt several times before serving with the Royal Flying Corps, being operated over the Western Front in the early months of the First World War. In 1912, a team at the Royal Aircraft Factory, lead by Geoffrey de Havilland, started design of a single seat scout, or fast reconnaissance aircraft, the first aircraft in the world specifically designed for this role. 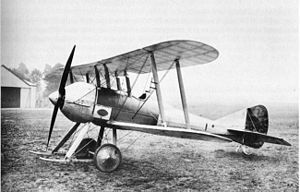 The design was a small tractor biplane, and was named the B.S.1 (standing for Bl�riot Scout) after Louis Bl�riot, a pioneer of tractor configuration aircraft. It had a wooden monocoque circular section fuselage, and single-bay wings. Lateral control was by wing warping,while the aircraft was initially fitted with a small rudder without a fixed fin, and an all moving elevator. It was powered by a two-row, 14-cylinder Gnome rotary engine rated at 100 hp (75 kW). The B.S.1 was first flown by Geoffrey de Havilland early in 1913, demonstrating excellent performance, with a maximum speed of 91.7 mph (147.6 km/h), a stalling speed of 51 mph (82 km/h) and a rate of climb of 900 ft/min (4.6 m/s), despite the engine only delivering about 82 hp (61 kW) instead of the promised 100 hp. However, on 27 March 1913, the aircraft crashed while being flown by de Havilland, breaking his jaw and damaging the aircraft. Following this accident, it was repaired, with an 80 hp single-row Gnome and new tail surfaces, with triangular fins above and below the fuselage and a larger rudder. While the repaired aircraft was initially designated B.S.2, it was soon redesignated S.E.2 (for Scout Experimental). It was flown in this form by de Havilland in October 1913. In April 1914, the S.E.2 was again rebuilt, this time under the supervision of Henry Folland, as de Havilland had left the Royal Aircraft Factory to become chief designer of Airco (the B.S.1/S.E.2 was the last design de Havilland produced for the Factory). The tail surfaces were again revised, with a larger fin and rudder, with new tailplane and elevators. The monocoque rear fuselage was replaced by conventional wood and fabric, and more streamlined struts and streamlined sectioned bracing wires (Raf-wires) were fitted. It was flown in this form on 3 October 1914. This modified version is often referred to as the "S.E.2a" - this designation was not used at the time, and was probably not official. The S.E.2 was handed over the Royal Flying Corps on 17 February 1914, with the serial number 609 being issued to No. 5 Squadron, where it made a good impression, and then to No. 3 Squadron before being returned to the Royal Aircraft Factory in April. By the time the rebuilt "S.E.2a" version was completed, the First World War had broken out, and the modified S.E.2 was sent across the English Channel to join No. 3 Squadron on 27 October. It was fitted with an improvised armament of a pair of rifles mounted on the side of the fuselage, angled outwards to avoid the propeller, together with the pilot's revolver. It was one of the fastest aircraft available in the early months of the war, with it being said that:"Its speed enabled it to circle around the enemy machines and gave it a decided ascendancy." It remained in use with 3 Squadron until March 1915, when it was damaged by an exploding bomb and was sent back to England. Mason, Francis K. The British Fighter since 1912. Annapolis, USA: Naval Institute Press, 1992. ISBN 1-55750-082-7.